Contextualising evidence to inform policy-making is increasingly recognised as key to developing and implementing effective health policies. Several previous studies have indicated that research evidence can enhance the processes of health policy development and implementation [1–5]. Despite the importance of science in health policy-making, a considerable gap remains between research evidence and the formulation and implementation of health policies, particularly in low- and middle-income countries (LMICs) . Several studies have attempted to understand the suboptimal use of research evidence in policy-making, with findings suggesting the following key factors impeding evidence uptake: (1) lack of available research; (2) poor dissemination of research findings; (3) limited access to research, for various reasons including cost; (4) lack of clarity, relevance and reliability of research findings; and (5) unsuitability of the format of research output [5, 7, 8]. WHO has underlined that policy-makers need access to the right information at the right time to support evidence-informed decision-making . Timely, suitably packaged and policy-relevant research can foster the use of evidence in policy processes in LMICs [10–13]. Additionally, the importance of developing concise materials and tools to communicate various types of information to policy-makers and those supporting them is well recognised . Evidence exists for the value of information-packaging efforts designed to support action based on messages arising from research and other policy-relevant information [11–13]. Additional evidence suggests that effective communication relies on various factors, including readily understandable research, presentation of timely data in visually compelling formats, use of illustrative anecdotes where appropriate, creation of clear key messages about the meaning of the data, suggestions of ways to use research findings for answering important policy questions, involvement of policy-makers in the planning and execution of health research, as well as involvement of researchers in the planning and execution of health programmes, prompts of relevant articles or evidence briefs targeted to appropriate policy-makers, and establishment of relationships of trust and credibility with policy-makers [14–17]. A one-stop shop for research evidence can allow health system policy-makers, stakeholders and researchers to efficiently find and use the best available research evidence in the limited time they have available to make, inform or advocate for a decision . Several one-stop shops already in existence were designed to provide information related to clinical programmes and services, prescription drugs, and public health programmes and services [23–28]. In recent years, global one-stop shops have been developed to address issues related to health policy and health systems, with a focus on decision-makers, including the Health Systems Evidence repository, the Health Technology Assessment Database, EVIPNet (the Evidence to Policy Network), the Virtual Health Library and the PDQ-Evidence repository [23, 28–31]. However, to date, few one-stop shops have been established in LMICs to address their needs for health policy and health systems evidence. More specifically, there has been no health policy repository in Nigeria that could be regarded as a one-stop shop for various types of high-quality evidence (e.g. peer-reviewed research publications, expert opinion, policy documents and grey literature) specifically relevant to policy-makers’ needs for decision-making in that country. 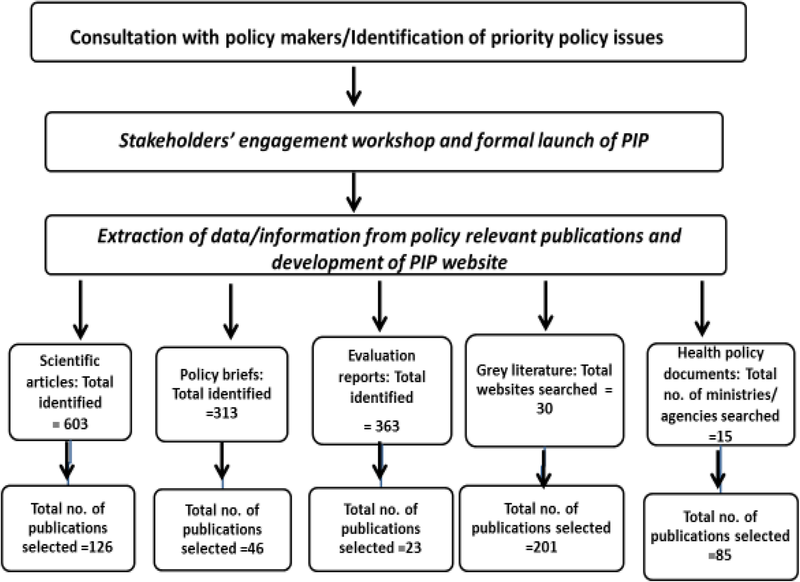 For the purpose of the PIP, a policy brief was defined as a policy document that clarifies a health policy problem, renders the evidence for addressing the problem concise and understandable, explains why the evidence is important, describes evidence-informed policy options that would be suitable actions for policy-makers to take, and provides key implementation considerations [33–35]. A Google search was performed in August 2015 with the keywords ‘policy brief’, ‘health’ and ‘Nigeria’, yielding a total of 313 entries, of which 46 policy briefs were selected. Each selected document fulfilled the following inclusion criteria: (1) must be a policy brief that meets the definition given above, (2) must focus on Nigeria, (3) must focus on the health of the population, and (4) must highlight recommendations relevant to health policy-making. The outcome of our evaluation of the PIP showed strong acceptability and feasibility of the one-stop shop platform as a resource to inform policy and systems decisions in Nigeria, including but not limited to policy analysis. Our study also identified the PIP as an asset that might strengthen the interest of policy-makers in using evidence for policy change. Decision-makers in the present study expressed their willingness to use research, which corroborates previous experiences showing that decision-makers are likely to use research evidence for policy-making when the evidence is available and accessible in a timely and user-friendly fashion [2, 4–6]. In this regard, the PIP explicitly aims to address the main barriers to integrating research into policy and practice, including high costs of access, poor clarity, relevance and reliability of research findings, and complex format of research outputs [7, 8]. Our study further reinforces previous recommendations to improve reporting formats to enhance the intelligibility of policy-relevant research outputs [2, 6, 14]. It is pertinent to state that the PIP may not be able to entirely support the translation of evidence into policy and enhance the capacity to access evidence. We are, however, confident that the availability and accessibility of the evidence in this platform are stepping stones towards enhancing any effort by policy-makers in evidence uptake and improvement of their capacities to access evidence. According to Lawrence et al. , peer-reviewed journals might be considered “the most credible source of evidence”, but the reality is that policy-relevant evidence is found in many kinds of resources circulating in the public sphere, most of which fall into the category of grey literature. The importance of grey literature therefore lies in its ability to communicate complex information in simple terms and to disseminate results more quickly . Previous experience has shown that, in policy settings, information in the grey literature may be given greater emphasis than information from peer-reviewed journals because the language is more accessible; furthermore, more rapid and more flexible delivery of information can facilitate knowledge uptake in situations where decisions are based on competing factors (e.g. the pressures of political processes) [50–54].